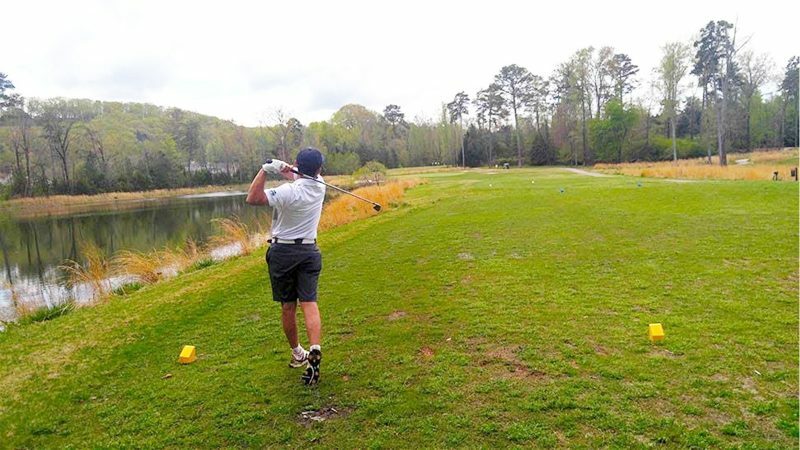 HARRISON, Tenn.- The Bryan Lions hosted the AAC 2019 Spring Championship April 8-9 in Harrison, Tennessee where 12 AAC teams and 71 players participated at the 7137-yard Bear Trace at Harrison Bay. The event started off on a gloomy note as the weather called for rain. The players had to start in the unwanted conditions, but by mid-morning the rain cleared off and warmer temperatures prevailed leading to players improving throughout the day. At the end of the first day the leaderboard was topped by Matt Smith of Truett McConnell University (Ga.) where he shot a 65. Truett McConnell ended the day as a team at 281 followed by Point University at 286. The Lions sat at eighth but well within striking distance of the top teams. The Lions had five players scoring in the 70s on Day 1 with junior, Andres Arteaga leading the way with a 74. Two strokes behind was sophomore, Kevin Knudsen who shot a 76 followed by sophomore Gareth Moody at 77, freshman, Peter Brown 78, and junior Zach Belvin fired a 79. Going into the next day the Lions sat just three strokes from fifth place and looked to improve. As Day 2 went on, the Lions were surprised by Milligan College (Tenn.) and Columbia International University (S.C.). Bryan as a team shot 321 compared to 305 Day 1 for a total team score of 626. Milligan shot 307, an eight-stroke improvement, landing them ahead of Bryan. Columbia International only shot three strokes worse, which was steady enough to move up to eighth. The Lions individual leader ended up being Kevin Knudsen who shot 76 Day 1 and 75 Day 2 totaling 151. Kevin’s consistency tied him for 21st, an eight-spot improvement. Freshman Peter Brown also played very consistently with a score of 78 both days where he stayed at 38th. Andres Arteaga followed at 47 with a Day 2 score of 82. Three spots down Gareth Moody shot 82 for a total of 161. Teammates Zach Belvin and Parker Hill trailed, respectively. Overall Truett McConnell won it all where they shot 570 with individual champion Matt Smith leading at 137. Teammate Dawson Day closely followed in third and shot 140. Point University ended with three players in the top-10. Up next for the Bryan College golf team they travel to Adairsville, Georgia to wrap up the season at the NAIA Direct Qualifier Sunday through Tuesday, April 21-23.